China is Central Asia’s new energy giant and the Russian profile is being irreversibly overshadowed. Ashgabat was all ready to produce its first gas at Galkynysh, reputed to be the world’s second largest gas field, on June 30, the 56th birthday of Turkmen President Kurbanguly Berdymukhmedov. But then, Reuters reported, Ashgabat deferred the ceremony to launch the production at Galkynysh to sometime in autumn so as to include the historic occasion in the itinerary of visit to Turkmenistan by China’s President Xi Jinping. For Ashgabat there could be no country today that is more important than China in its external relations. 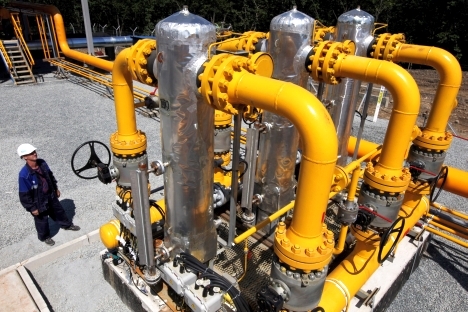 Turkmen gas exports to China totaled almost 50 billion cubic metres as of end-May 2013. This compares with 10 bcm gas exports to Russia, which used to be Turkmenistan’s top client historically. The $9.7 billion project to develop the fields at Galkynysh began in 2009 with the participation of service contractors from China, the UAE and South Korea and three gas processing plants with a combined annual capacity of 30 bcm are expected to come onstream by the end of this year. Galkynysh would eventually boost Turkmen natural gas exports to China to a whopping 65 bcm annually by 2015. Truly, there is an occasion here for Berdymukhmedov to celebrate and he decided he would rather do it with Xi on his side. It is a manifestly assertive claim with the touch arrogance, perhaps, but it cannot be contested on facts. China’s ambitious Central Asia gas pipeline is expected to have up to four connecting feeder pipelines connecting the trunk line running from Turkmenistan, which connect gas fields in Kazakhstan, Uzbekistan, northern Afghanistan and Tajikistan, bypassing Gazprom’s Soviet-era pipeline grid in the region. China is working according to a grand design. It is all set to produce the first Afghan oil and now comes the stunning development that CNPC has acquired on June 18 one-third share in the gas deposits in Tajikistan’s southwestern Bokhtar region (close to the border with Afghanistan and Uzbekistan) held by Canada’s Tethys Petroleum. The prospective reserves here are estimated to be in the region of 3.22 trillion bcm of gas. Tajikistan has the potential to emerge as an important gas producer in the Central Asian region and, to be sure, CNPC has appeared at the doorstep in Dushanbe. It may be a small step in China’s massive expansion into the region’s energy sector as a whole, but a significant enough leap forward in Chinese-Tajik relations and indeed in the geopolitics of Central Asia. In comparison with China, India figures as a mere blot on the Central Asian energy map. The latest indication is that China is set to pip India to seal the acquisition of the Conoco stake in Kazakhstan’s giant Kashagan oil field on the Caspian. The TAPI gas pipeline is still nowhere near realization and, ironically, the instability in Afghanistan works to the detriment of India (and Pakistan) – and conversely, to the CNPC’s great advantage.